Local discovery mapping apps like Caterina Fake’s Findery – which recently launched for iOS – are not a new idea. In fact, the Web version of Findery was kicking around for more than a year before a native mobile app was launched. Nonetheless, undeterred by already established competitors like this is Geopieces – a new player on the block that has been operating in stealth mode. Available to download for Android devices or to use via the Web platform, Geopieces is one part Findery, one part The Million Dollar Homepage. 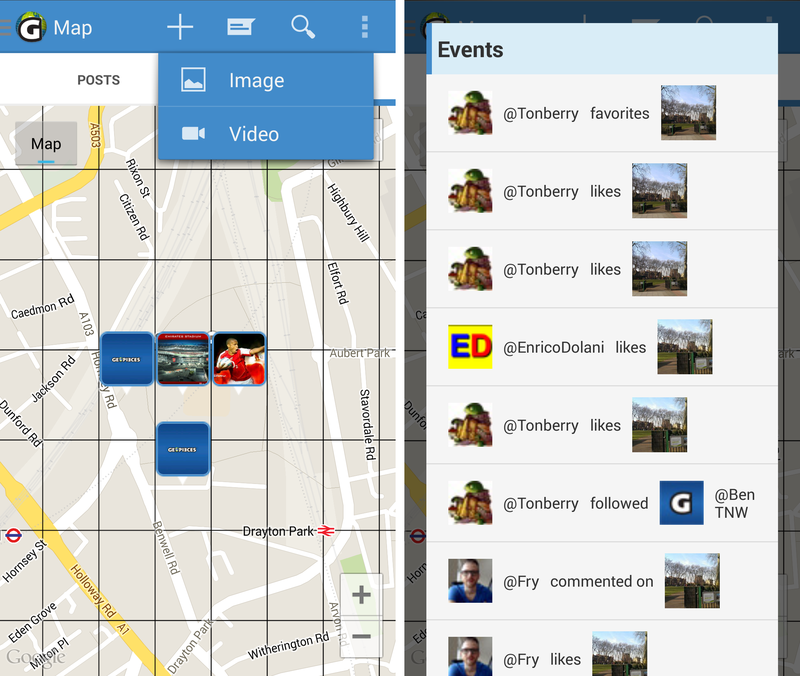 There’s also a Foursquare-like element too. Kind of. 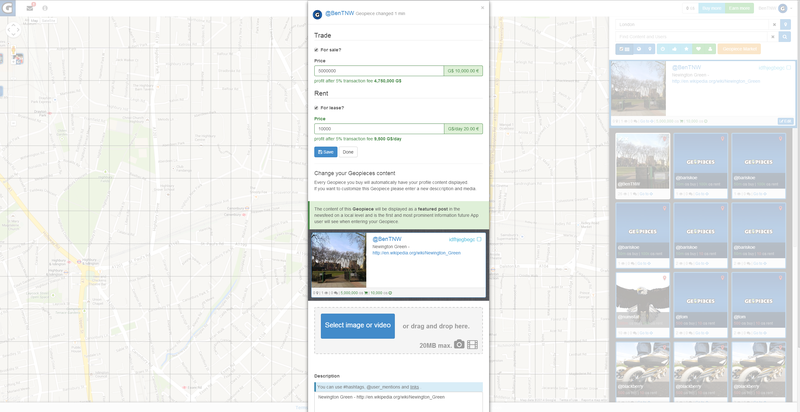 In essence, it allows users to snap pictures of notable things and upload them to a map – that’s the note-taking/discovery aspect of the service. On another layer it also allows you to purchase the ‘Geopiece’ for each section of the map. On first opening the app, Geopieces asks you to log-in via Facebook or to create an account. There’s no option to take a look around before logging in. Once you’ve created an account and logged in, you’re launched straight into the ‘Map’ view of the world, centred on wherever you are. It’s from here that you can choose to either browse around to see other items that people have posted, or look in ‘Post’ view – which shows you the newest, closest items around you. On first load, however, it might be nice to have a bit of a tour, or a general tutorial to give general pointers on what the app is for and how it works. 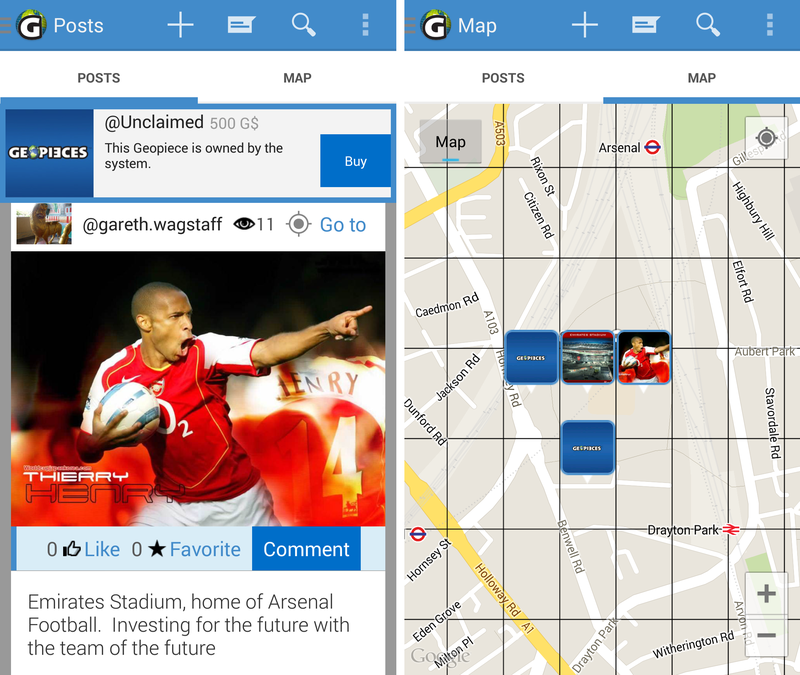 As it is, the idea is to tag places and items that you find interesting and check out other people’s to find out more about places around you. Viewing the tags can be done either via the Web (shown below) or the Android app. As you can see from the image above, there’s a search box in the top-right hand corner of the page, and another box below it to filter for specific terms. The numbers shown by each area on the map denote the amount of tags in that area – the items are then shown if you zoom in closer. As well as simply tagging the world around you, there’s the option to buy any available Geopieces on the map. As the owner, you get to set the sale or rental price, and the image that is displayed on the map. There’s also a short description box which allows for links too, so a small local business could buy a Geopiece in order to have a permanent ad there, for example. 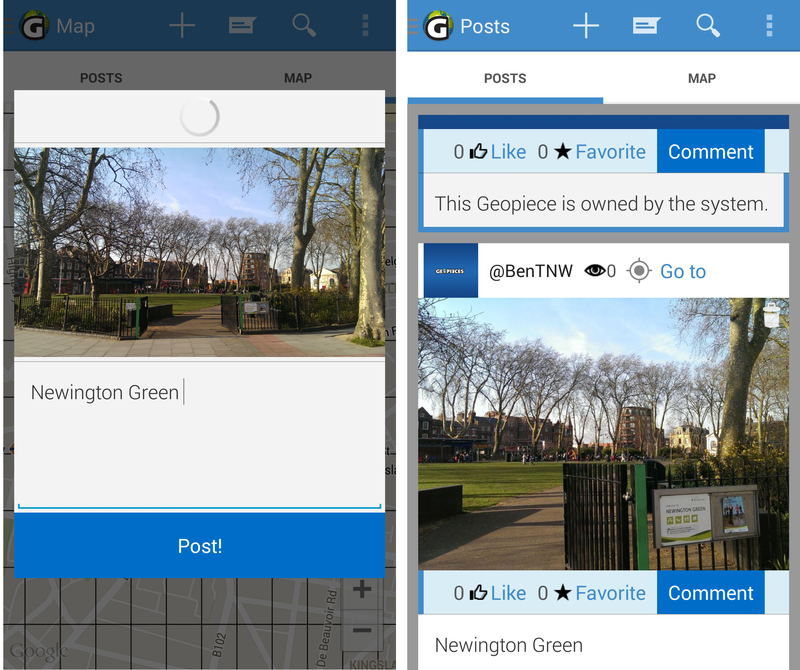 To test it out, I decided to go and tag a local park as a place of interest. Unlike other similar apps, you actually have to be in the place you’re tagging – there’s no option to add points of interest you know of, but aren’t physically at. To add content, you need to tap the + sign at the top of the screen, and then select Image or Video, depending on what you want to upload. The icon next to the + sign brings up a list of your notifications within the app (referred to as Events) – things like people following your profile or liking/favoriting your shares. In this case, I thought a video of my local park might be just a little too much excitement, so I chose Image instead. The app then launches you into your normal camera app for you to take a picture (or video). One you’ve taken it, you just need to confirm that you’re happy with the snap and choose to post it to Geopieces. Eagle-eyed readers will notice that the picture below-left is not actually the one that was eventually posted, shown below-right in my Posts stream after uploading. So, on one level, it’s a network for posting and discovering information – on another, it’s a virtual advertising board. The platform uses its own currency referred to as G$ and you’re given G$500 when you sign up so that you can start buying up Geopieces. The cost of a standard pre-purchase Geopiece seems to be G$500 and the equivalent value is €1. To get more, you can either buy them using real money (at that same exchange rate of G$500 for €1 or earn G$250 for each friend that signs up through your own special referral email link. So, once I had taken my picture and posted it, I decided I wanted to buy the Geopiece it sits on (in an area of London that’s not likely to be in high-demand, admittedly). To do so, I simply selected the Geopiece my image is on and clicked ‘Buy’. Once you own it, you get to offer it up for sale or rent at any price you wish and can add information to it, like an ad for your business or a link to a website. By default, any Geopiece that doesn’t have a specifically uploaded image by the owner will show the owner’s profile picture. I chose to add a slightly different image of the park as the image for the Geopiece and set the price at a reasonable G$5 million (€10,000). But what’s the point of buying a Geopiece? Well, essentially it serves as a billboard that sits at the top of the stream of posts for any content tagged within the same Geopiece. So, if anyone else decides to share something from the same park on Geopieces, the information I put in (actually just a link to Wikipedia in this case, although it could well be an advert showing 10% off at a local cafe instead, for example) will always appear at the top of the stream of posts for mobile users. As a user, you can tag infinite locations (for free) and if a single Geopiece has too many things tagged to it, the older ones are gradually decayed and moved further out of sight. To be clear, it’s not just for buildings or parks – it’s designed to be used to tag anything of interest in your local area. Right now, if someone does want to buy your Geopiece, you’ll only get the equivalent in G$, but the company said it is “in the process of negotiating a deal to establish a stock exchange from G$ to real currency”, so it looks like the option to make real cash could be on the horizon too. The app is clearly only a first shot, although that’s not to say it’s buggy or doesn’t work – there are just a few things that could make it a bit more effortless getting around, such as streamlining the way you view, like and comment on posts. More generally, the concept as a whole seems to be one that people are willing to buy in to – tag local things around you for local people to see. A sort of ‘hyper-local Twitter’. And while it’s more about discovery than easy sharing of certain locations, it’s not totally dissimilar to What3words, which lets people buy words associated with certain places. However, the concept of owning Geopieces is a little confusing to the end-user experience at first. I’d imagine, for people without a business or service to advertise (which includes me), the whole concept of G$ (and the prominence that blank but owned Geopieces take in the app and on the map) is unnecessary for a service that’s about local discovery. What will ultimately dictate the success of the service is amassing enough users to generate enough content to keep the service fresh and interesting. And by extension, without that critical mass of users, no local business is likely to want to buy or rent a Geopiece in the first place.